The Lio SP pendant light by Vistosi has been designed by Archivio Storico Vetereria Vistosi 1972. The blown glass cylinder was created with technique that enables modeling a white glass band into several layers of crystal. It radiates a glow of light to any decor. 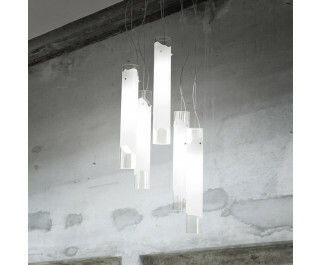 This beautiful light has been handmade on the Venetian island of Murano.